Carlos Ghosn, one of the world's best-known chief executives, is now in the spotlight after a sudden reversal of fortune. Ghosn, 64, will be dismissed from his role as chairman of Japan's Nissan after an internal investigation found he underreported his income and engaged in other "significant misconduct." Tokyo prosecutors arrested him Monday for violations of financial law. 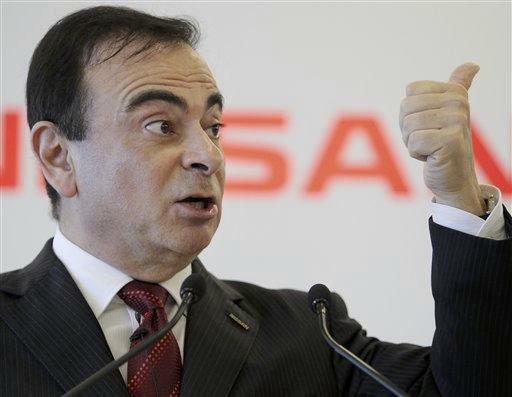 The auto executive's downfall complicates the future of the alliance between Nissan and France's Renault and Japan's Mitsubushi that Ghosn had sought to make permanent, according to Bloomberg News. Renault, which owns more than 40 percent of Nissan, said it would defend its interests within the alliance after Ghosn's arrest. Ghosn also serves as Renault's CEO. Ghosn (pronounced "go-an") is a household name in Japan, where he's considered a business superstar and even earned a manga comic book about his life. He was treated with the same adulation as rock stars or sports celebrities, perhaps partly because he was unusual in Japan as a non-Japanese chief of a major company. Yet the executive isn't as well known in the U.S., at least outside of business circles. Born in Brazil to Lebanese immigrants, Ghosn speaks several languages. He studied at the École Polytechnique in Paris and then joined Michelin, where he climbed the ladder to become the CEO of its North American operations before moving onto Renault and Nissan. His nickname is "Le Cost Killer"
Ghosn earned the nickname from his work at Renault, which he joined in 1996. He oversaw the company's South American division, which he returned to profitability through restructuring. Ghosn next applied his restructuring efforts to Nissan, which was near bankruptcy, after Renault took a 43 percent stake in the Japanese automaker in 1999. He cut 20,000 jobs at the automaker, with 12,000 of those in Japan. Nissan was losing $1,000 for every car it sold in the U.S., Ghosn wrote in a 2002 Harvard Business Review article about his efforts. He said he initially faced "flak as the foreigner in charge," but that he won over employees because he showed them respect. Ghosn was an early supporter of electric cars like Nissan's Leaf. The Renault-Nissan-Mitsubishi alliance, which started work on the electronic car development efforts in 2008, recently said it planned to produce 12 new electric cars within five years. "We are probably the only carmaker who's starting to make money selling electric cars," Ghosn told CNBC earlier this year. Ghosn's pay has come under scrutiny before, with the French government last year objecting to his $9 million package as CEO as Renault. A union official at carmaker Renault is welcoming the Japanese investigation into Ghosn's pay. Ali Kaya, who heads the CGT union at a Renault factory in Flins outside Paris, said "the most shocking thing is that these people were not arrested well before this." He lamented that the public has grown inured to "astronomical sums" paid to Ghosn and other executives. The powerful, hard-left CGT has long campaigned to cap executive pay. Tokyo prosecutors said Ghosn is suspected of understating his salary by 5 billion yen, or about $44 million, according to Japan's Kyodo News. That would violate the country's Financial Instruments and Exchange Act, which could result in either up to 10 years in prison, a fine of up to 10 million yen ($90,000) or both. --With reporting by The Associated Press.